That big green chunk of geography represents overwhelmingly Baptist populations. The "thin red line" stretching roughly from northern Virginia across to the Midwest is primarily Methodist. Mormons are chiefly located across Utah and the western states. Lutherans have their stronghold around the Great Lakes. Catholics are heavily settled in New England. 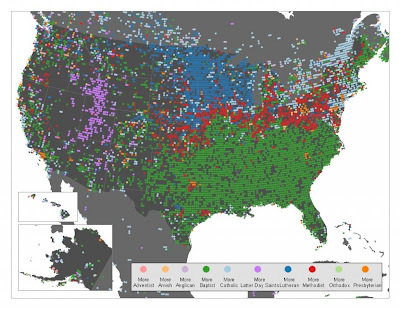 And if you examine the map further you can find places populated by the Amish, Presbyterians, Seventh-Day Adventists, Orthodox and Anglicans.